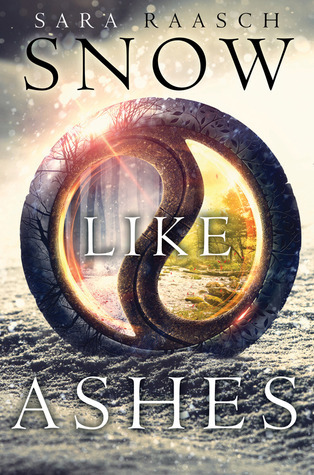 I am always amazed when a new author can waltz into the YA genre and put froth a book that would make any seasoned veteran envy and that is exactly what Raasch has manged to do with Snow Like Ashes. I was completely blown away by how well put together this novel is. How well the storyline flowed, how lovable the characters were and how even something as simple as the dreaded love triangle, just worked and worked well. I really don't even know what else to say about this other than, once again, I am in love with this genre and all that it has to offer. Meira is everything I like in a heroine. Strong, fierce, brave, and she loves fiercely. She is a fighter in every sense of the word and I just connected with her from the beginning. Mather and Theron were both wonderful in their own separate ways and yes, I did say there was a love triangle, and let me tell you, both boys are equally fabulous. It will be hard in the end when one gets hurt but I also have to admit, that instead of being irritated by it and rolling my eyes at the tangled web of love, it just worked and was believable. Miera isn't wishy washy like most heroines in her place and her love for the two, are different and both have their advantages over the other. Both would be great for her. Both would let her grow and both have my admiration for different reasons. This book really did have the right amount of secondary characters, villains and of course main characters. The right amount of romance, action, mystery, and of the paranormal. It truly gave me every single thing I was hoping it would and left me wanting more by the end. I loved the world Raasch created. It was detailed and explained without once feeling like overload of info being dumped on you having it affect the pacing of the story. I am so excited I took a chance and read this and not just liked it, but loved it. I love when hype pays off and books really come through and shine. This one sounds so good and I'm glad to see you had a great time because i saw a lot of glowing reviews about it. I need to try! One day! I'm so glad you loved this too! I adored the story and I must admit, personally I kind of hated the love triangle and would love it if Theron got pushed out of the picture. xD I'm such a huge Mather fangirl and I will probably throw a fit if Meira ends up with Theron! But yes, *individually*, both men are great. I can't wait for the sequel of this one! Oh, strong, fierce and brave is just how I like my heroines too! Haven't got around to read this one yet, but it will happen in the next few weeks for sure. I have yet to read a review that wasn't complimentary! And I do have a soft spot for debut authors :) Great review! I've seen so so many reviews of this book and some brilliant ones too. I am very picky with fantasy books and especially ones that have a massive hype too. I really need to read this one soon I think. :) Great review. I hope you give this one a chance Emma and enjoy it! I have been dying to read this. I'm super excited that this new author blew your mind! I've been really wanting to read this one since it came out. I'm really glad to hear you liked this one! Thanks Natalie, I hope you do too! I know you would like this Kim! I hope you give it a chance. I'm not much of a fantasy ready but I've seen this book everywhere and it kinda sounds good, with the medieval warrior thing going on. I might try to pick this up one day! Thanks for sharing! This really isn't too high fantasy trust me, I don't do high fantasy but I loved this! Hi Ali, great review. I LOVE It when a debut author Rocks her first novel too. I look forward to trying this one. Amazing in any genre really to find one like that. Always gets me giddy :) Glad you loved it! Thanks and me too Anna! Have a nice weekend! I'm about 30 pages in and had to put it down because review books were piling up :( I can't wait to get back into the book and meet Theron! Mather is already wonderful. This is one love triangle I'm looking forward to reading! I hope you can pick it back up soon! Balzer and Bray is now my YA Fantasy go-to. I always love their YA novels. That said, I'm thumping my head for not grabbing this. A friend went to her signing and asked if I want a book. I declined ebcause I'm ignorant. What a mistake! They do have a great line of authors for sure! I do hope you can get a copy! You've convinced me. Awesome review ! Oh, yeah ... this is one I want to read while I'm in my fantasy phase. There seems to be a lot of good fantasy in YA lately. Or maybe I'm just now REALLY noticing and have interest. It sounds like a really great balance of all the elements we want in a read. This book sounds really good. I know that every once in a while, a love triangle really works and this sounds like it's one of those cases. So glad you liked this too Kim! I absolutely agree with you! This book was so good and I was surprised to know it was a debut with how beautiful and lyrical the narrative was. I'm so excited for book 2 that's for sure! Yay! So happy you loved this Faye! I am so excited about book two! I am so happy to hear that this is such an incredible book. I probably won't be able to get it until summer, but it sounds like I'm absolutely going to LOVE it. I quited enjoyed it, buuuut I did want more magic :/ And a better romance! That love-triangle ugh. :P But I'm glad you liked it so much, Ali! Thanks Lola, me too, sorry you didn't like it more and yeah, love triangles are never wonderful anymore but I am hoping it will be better in book two. Did you like it enough to continue the series? I hope you do read it eventually, it is definitely worth the read! I'm super drawn to covers, and this one is gorgeous; I've had it on my to-read list since it came out, and I've been dying to read it! I'm so glad you liked it!! I SO want to read this book - I have seen nothing but amazing things about it. I definitely need to buy this one soon!! I've heard only amazing things about this book. I even bought a copy, so hopefully I can read it soon. Wonderful review! Sorry I've been absent. I've had a headache from hell. I'm going to try to catch up now. No worries! I hope you are feeling better! Wow, this certainly sounds amazing. It's been a while since I read any fantasy books. I think I might just have to check this out. Fantastic review. Thanks Ellen, I hope you do and love it!